It took a while to disassemble the tent and to collect our scattered belongings; including the unwashed suferiers where the soon to be legendary and much talked about Chicken a la Rusinga had been created, surely for one and only time in the universe! We were late, packed the car in a rush and, rather casually, left Mbita Point for our rendezvous with Alan in Kilgoris. I would remain with Alan to visit his field trials and collaborators while Matt returned to Nairobi, probably to attend some important meeting (read trout fishing) over the weekend. We got to our meeting point, an open field in Kilgoris, meant –at some point in future- to be the village’s main square but currently occupied by grazing Maasai cattle and found Alan waiting for us. A few dukas were found around the field that were clearly taking care of Maasai needs: lots of red cloth and assorted veterinary drugs among other essentials such as Tusker beer. 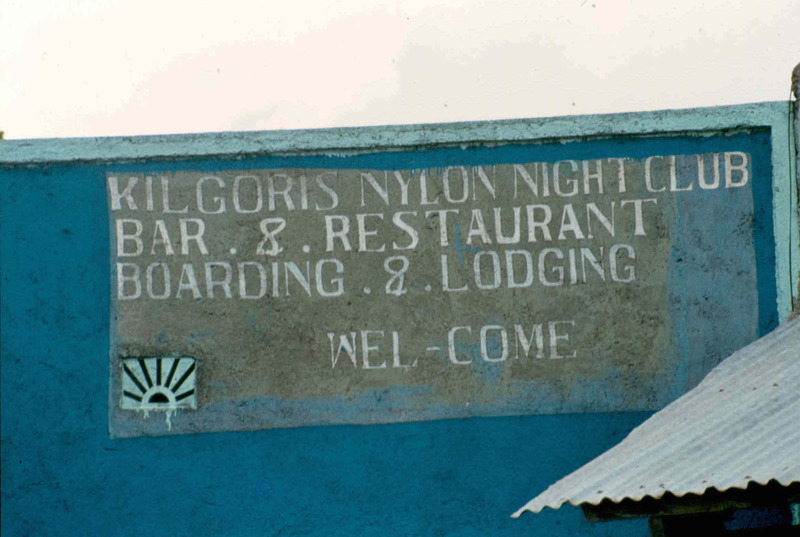 Just across the road was the “Kilgoris Nylon Day and Night Club”, a name that took me a while to digest! Despite its interesting name, we refrained from exploring it and preferred to miss lunch. What we would have found in it will remain shrouded in mystery. Alan welcomed me and, after a quick exchange of news and greetings Matt went his way and we headed for Intona ranch. The meeting point with Alan. Alan was a chain smoker of menthol cigarettes, he stammered in an Irish accent, had an easy laugh that he combined with rubbing his gold and gray goatee. As we moved on, it became evident that Alan was not concerned about potholes and I was treated to the unique experience of listening to his mostly one-way conversation while bumping around on a rough road. 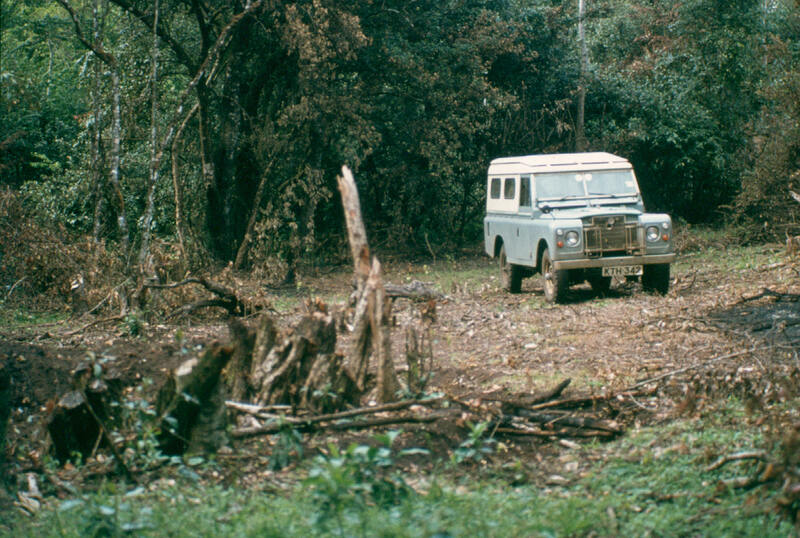 Luckily we were in a Land Rover Series III, an almost unbreakable vehicle. Although I focused fully on Alan’s conversation I still needed to guess a lot of what he said. I learnt that he was born in Northern Ireland and studied parasitology in London. He had come to Kenya in 1968 where he remained since, with a few short spells back home. He was a great supporter of the infection and treatment method to protect cattle against this scourge and he had helped Matt to develop it. I also learnt that collaboration was everything for him and that he was already talking to me as if we were already working together. This was excellent after my earlier experience in Mbita Point. Things were looking good but I still needed more details. “That is the purpose of this trip”, I thought, and continued listening. Our budding friendship was further boosted when we discovered our shared passion for soccer and the fact that Alan knew and liked some of the Uruguayan soccer players of the day, particularly Rubén Sosa. He explained that he first came to the Transmara to collaborate with a veterinary GTZ project near Lolgorian –another small Maasai town- where they had done some pioneer epidemiological studies on theileriosis. The fact that this information was available enabled him to select the prevalent Theileria parasites to be used for the immunization of cattle in the area, including Intona ranch. This breakthrough meant that tick control could now be relaxed and even stopped altogether. This, Alan said, would enable me to compare dipped and not dipped cattle subject to natural field tick challenge and, in this way, ascertain their impact to achieve my goal. Kilgoris was a Maasai town, Alan explained, the shambas we could see in the outskirts belonged to the Kisii people. The latter became less frequent as we moved out of the populated area and the landscape started to open up to a savannah ecosystem where Maasai cattle grazed, looked after by the usual herd boys or elders. The countryside was punctuated by brown manyattas, giant brown mushrooms scattered at regular intervals. 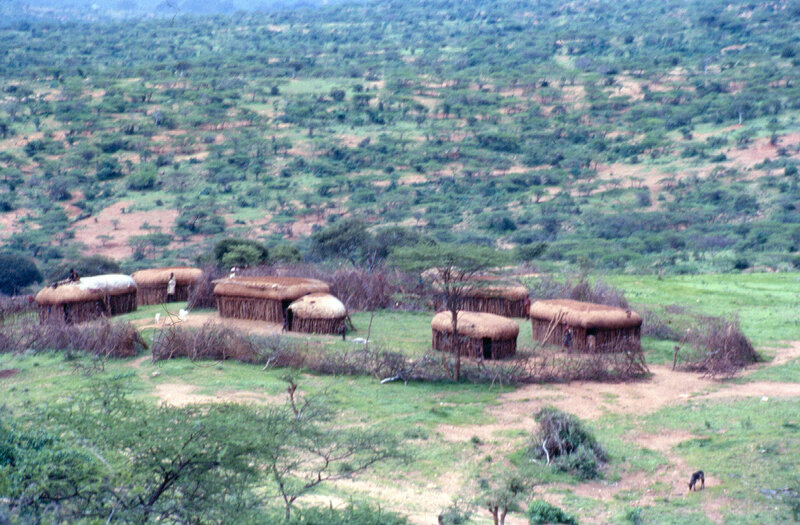 A manyatta is where the Maasai live. A strong thorn bush fenced area designed to keep all predators out and themselves and their livestock protected within, mainly during the night. Inside the enclosure there are any number of huts made of a rounded frame of branches and built with a mixture of mud and cattle dung. 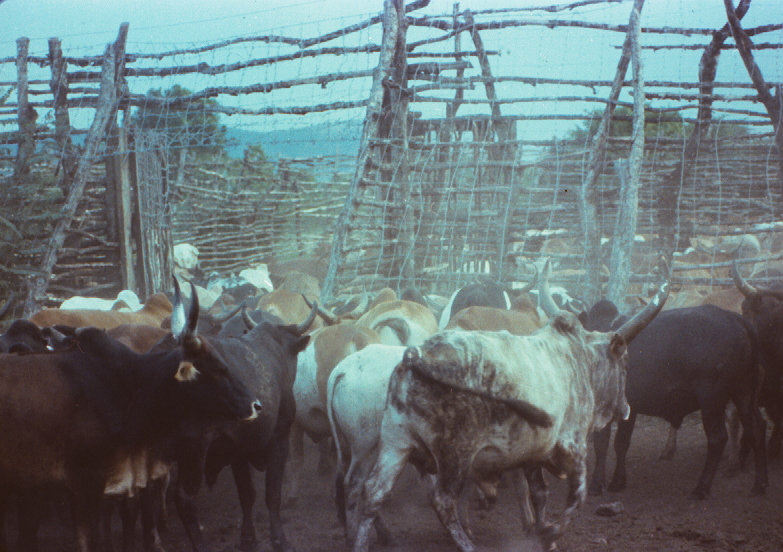 Most cattle are kept in the enclosure but there are smaller sub-enclosures for sheep and goats or animals belonging to the different dwellers of the manyatta. Cattle are heavily branded and their ancestry thoroughly known by their owners. “I know you will not believe this”, said Alan, “but there is a war going on here. The Kisii are moving in to occupy the Maasai grazing land”. He went on: “the Kisii will eventually win and this beautiful place will get all planted with maize!” Looking around, I found this really unbelievable but I trusted Alan. The mention of a war made me wary and I started to look for warring parties lurking behind the bushes. After a while of not seeing anything unusual I said with hope in my voice: “Luckily, I see nothing so there must be a truce at the moment.” Alan laughed heartily with profuse goatee rubbing and, after hitting a few more potholes, he explained that the fighting was in the bush and normally not obvious. He added: “the Kisii cultivate the soil and gradually they are being given land. The Maasai resist and there are frequent skirmishes and then the Government intervenes to bring back some degree of calm”. 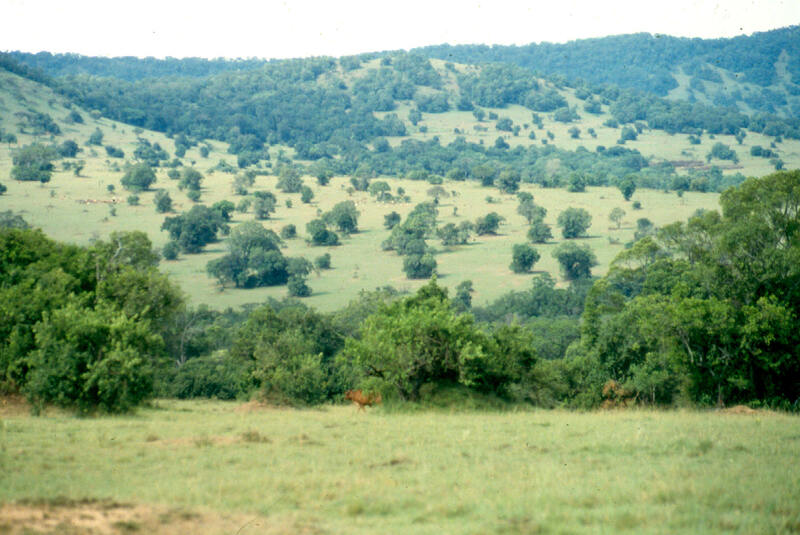 A view of Intona ranch in the Transmara parkland. Nearer to Intona ranch there was only lush green savannah with large tree islands. I noticed that these islands were always associated with bulky termite nests and I started wondering which appeared first, the trees of the termite mounds? I decided in favour of the trees. And then I saw the first game: a herd of Impala, shiny and healthy. Later, Topi and Zebras appeared to add a wild touch to the ever-present Maasai cattle. There were also Baboons and Vervet monkeys and a large number of Warthogs. The manyattas in this area had significantly more dramatic thorn enclosures and the presence of large predators such as Lion, Leopard and hyena came to mind as the reason behind the need for greater protection, but I learnt from Alan that cattle rustling was rampant and probably more of a concern than predators. Clearly the Maasai were not taking any chances with their beloved livestock. This was in sharp contrast with their seemingly casual bearing when walking in the bush only carrying a spear and a simmi with a few throwing sticks, their feet clad in recycled car tire sandals. They appeared to be carrying very light luggage considering all predators that were around, not to mention the on-going war! 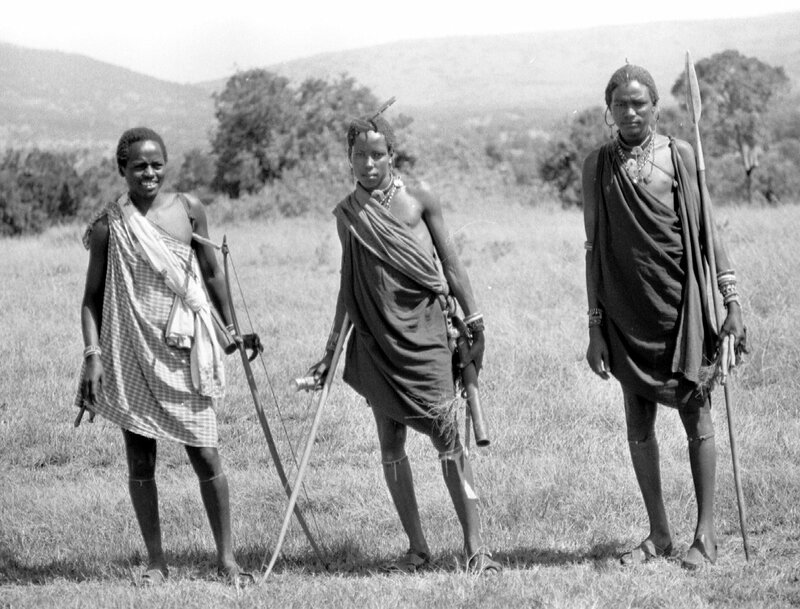 Maasai visitors with spears, bow and arrows and throwing sticks. The Transmara District that we were traversing is close to the Maasai Mara Game Reserve and the latter is the northern extension of the Serengeti National Park in Tanzania. 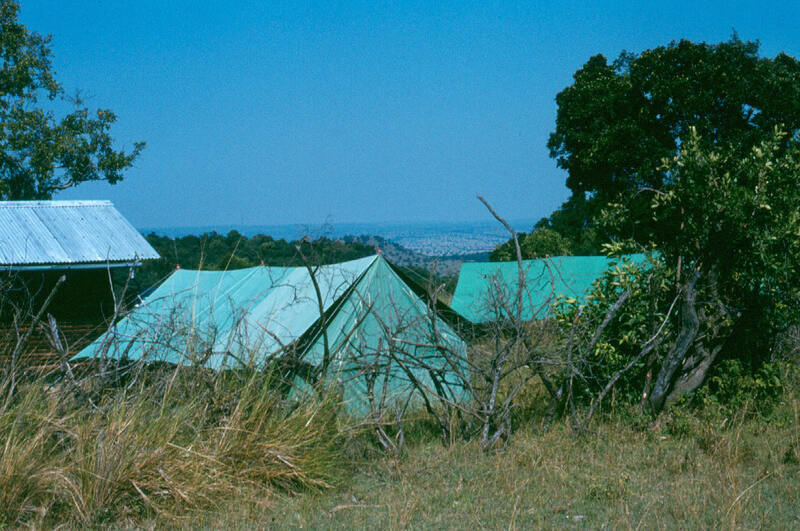 The Transmara is split into two by the Migori River with its riverine forest. It is here that, with luck, the Giant Forest hog (Hylochoerus meinertzhageni) can be spotted. A native of forest habitats in Africa, it is considered the largest wild pig, at over two metres in length and one in height, reaching more than 200kg of weight. Discovered by Richard Meinertzhagen in 1904, who shot the type specimen in Kenya. Another special of the area is the Blue Flycatcher (Elminia longicauda), a lovely cerulean blue bird with a beautiful tail-fanning display. “Julio, remember that Maasai do not like to be photographed and they can get very agitated and even aggressive”, said Alan. “Why is that?” I asked with surprise. “I do not know for sure” came the reply. I started learning that he was not too interested in any issues apart from theileriosis! During the trip I decided that I would work with Alan and started developing a plan to convince Matt that this was the best idea. Rather sleep-deprived by Matt’s snores, and despite the jerks and bumps, I dozed off. I woke up startled by the sudden stop. I prepared for a surprise attack by the warring parties! However, the herd of Wildebeest and Zebra in front of us did not look dangerous. They were frolicking about as only wildebeest can as they moved back into the parkland. Alan decided to follow them so that I could observe them better and take a few pictures as he liked photography. We drove off-road following them and got some good shots. When we decided that we had enough good pictures and turned back we realized that we were lost in the green labyrinth. The workers travelling with us were of the Kikuyu ethnic group. They were foreigners like us and therefore as lost as we were! We drove rather aimlessly for a while following a few cues we thought correct but the road was nowhere to be seen. Lost in the bush with Alan, prior to finding our Maasai “saviour”. In one of our turns we found a Maasai elder who asked us for a lift! We gladly obliged and he jumped in. In a mix of English and Swahili we asked him to take us to the road. He sat next to me, half on my lap, as we were already three in the front seat of the Land Rover. We were ridiculously close to the road and were brought back to it immediately. Our saviour stayed with us as, apparently, we were going in the same direction! 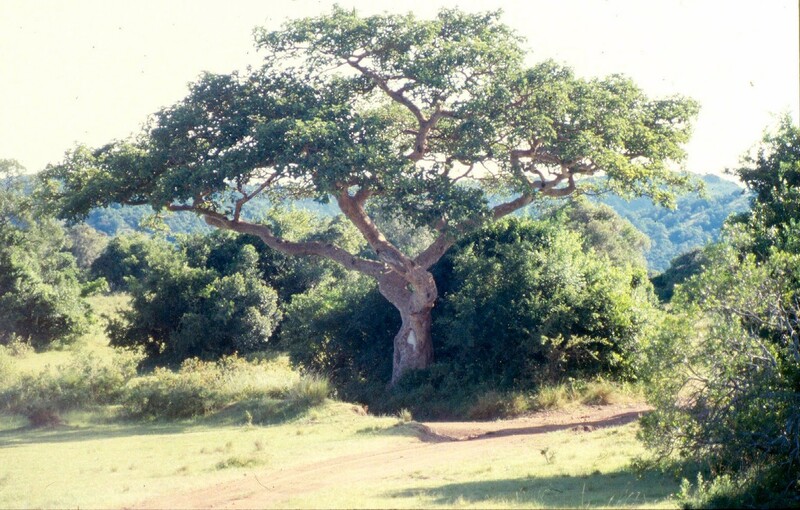 The fig tree, “signpost” to Intona ranch. Finally we got to a large fig tree on our right, the entrance to Intona Ranch and there the Maasai left us with our thanks. 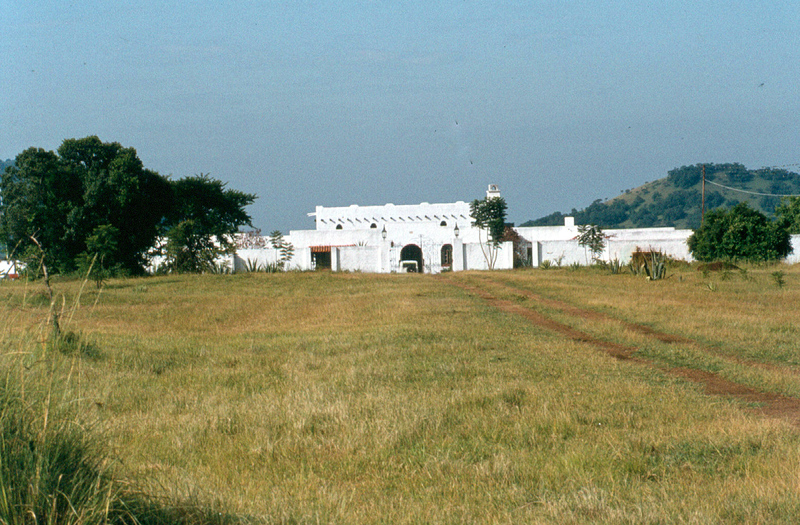 The ranch was still unfenced and largely undeveloped at the time. Its border was marked by a plough furrow! Alan drove through the ranch and showed me the crush pen, weighbridge and cattle boma. The latter was a large wood and barbed wire fortress. He also showed me the ranch personnel quarters and other back up installations such as the generator house and store. “The cattle are out grazing”, said Alan, “they will not come back until dusk so let´s take the personnel to their camp and then go to meet Joe and Sheila” he added. During the journey I had learnt that Joe was in fact Joseph Murumbi, an important retired politician. His mother was Maasai and he was given the land by them. 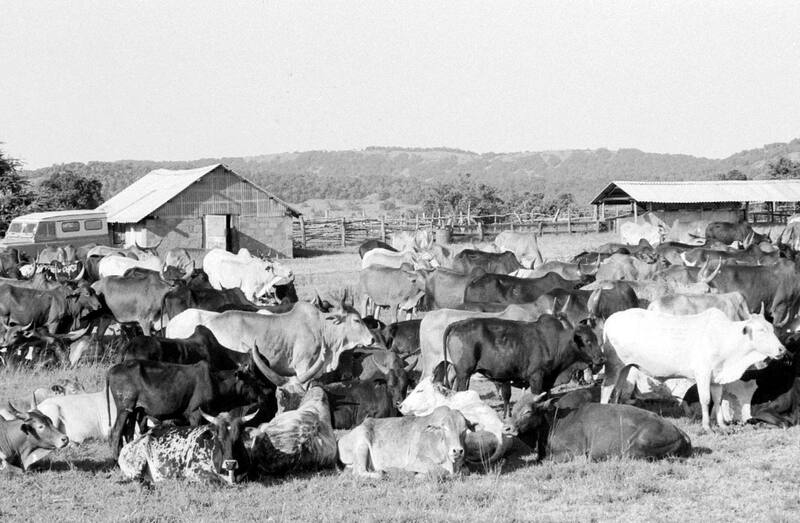 Cattle and facilities at Intona ranch. The herdsmen camp at Intona ranch. After about a kilometre a very large white house appeared, looking like a palace to me at that point. It looked newly built and was as beautiful as it was out of place. Its construction –I learnt from Alan- followed the Swahili style found at the Kenyan coast, complete with carved wooden doors brought all the way from Lamu and surrounded by a high white wall. We parked in one of the lateral entrances, announced our arrival and were shown in. A large white house appeared in the distance! We walked into a very large rectangular living room, its walls covered with art objects. The chairs were large and made of forged iron, including the one where a coloured person with Indian features sat, atop lots of cushions and surrounded by small dogs. I guessed him to be in his late seventies. He stood up with some difficulty and came to greet us with a warm look on his face. He was Joe. “How was the safari?” he asked and added: “they tell me the road is rough but I do not drive any more so I do not know”. Alan made a comment about the road and introduced me, explaining who I was and the reasons for my visit. Joe welcomed me and invited us to sit, while ringing a bell. Soon a white middle-aged woman in crutches came in. Joe introduced her to me as Sheila, his wife. As it was late afternoon some Tuskers were produced for us. “You must be tired Julio”, she said, “coming all the way from Mbita Point”. “We will have dinner very soon as Joe goes to bed early” she added. Over the beer I gathered that Joe had a special interest in books, largely fired by his Goan father. “I have many books” Joe said “and art” he added. I also learnt that Joe was recovering from a stroke and that Sheila’s hips were in a bad state and that she needed an operation soon. Dinner was a simple affair and we soon retired to our bedrooms. 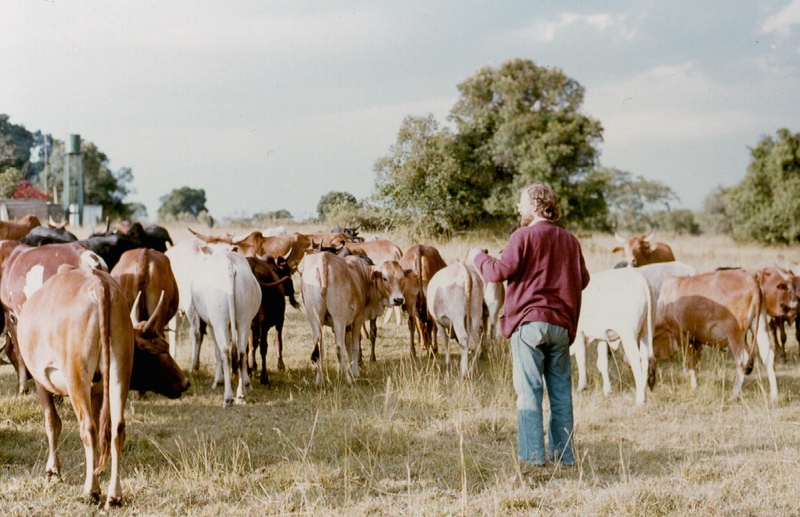 Alan´s had a microscope and piles of stained slides that he needed to examine, so he proceeded to check the health of his experimental cattle. I unpacked my belongings and feeling very tired I went to bed, leaving Alan with the microscope and the ubiquitous Tusker at hand. The following morning Alan woke me up before sunrise as we needed to check the cattle before they went out for grazing. We did not see our hosts as they were resting when we left. Daily body temperature, blood and lymph node smears are routine monitoring activities when working with theileriosis. That day we also had to tag a few animals. We needed to write on the tags with a special pen known as the “magic marker”. Alan asked one of the herdsmen -Ephraim- to fetch it. He went to look for it while we went to look at the cattle boma. This was an enormous 3-metre tall barbed wire enclosure where Joe´s cattle were kept, together with the experimental cattle. After inspecting it we went back to the crush pen to continue with the work but Ephraim was not back yet! Alan asked what was happening and was told that “he is coming”, the usual reply in these situations. Finally, after Alan’s patience was almost gone Ephraim appeared carrying a basin with hot water! When Alan saw this, he became quite angry. “What is this?” he asked. “What you asked for” replied Ephraim “maji moto“. The incredulous look on Alan’s face was very funny to see, and suddenly he laughed at the confusion and all the tension disappeared everyone joined in! Magic marker was mistakenly taken for magi moto, Swahili for hot water! Alan watching the cattle leaving the boma. Our work completed, we left the following morning, driving through the Maasai Mara Game Reserve. I loved the place! We crossed the Mara River on our way and had the chance to see the aftermath of the Wildebeest river crossings: a solid mass of dead animals being feasted upon by crocodiles and vultures, after the remaining beasts successfully continued on their migratory route. 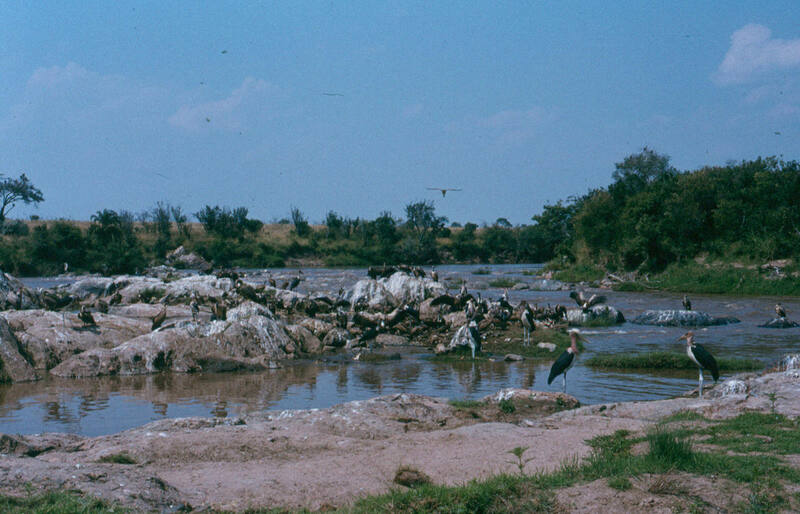 The aftermath of a wildebeest crossing of the Mara river. Seeing that natural marvel for the first time created a very strong impression on me. I believe that it was then that my life took a turn that would make me stay in Kenya and Africa. I decided that I would do all I could to persuade Matt that I should work at Intona ranch and, on my way to it, have the privilege of driving through the Maasai Mara Game Reserve! 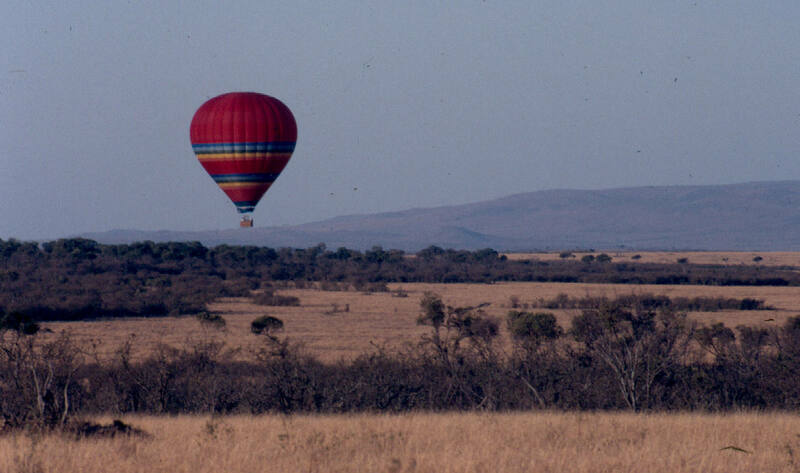 A hot air baloon flies over a rather dry Maasai Mara. Follows “Chicken a la Rusinga”. Swahili for a general store shop. Red was the dominant colour for the Maasai “tunics” at the time. Sadly he died on 15 March 1995. I placed his Obituary in the Pages section. Swahili for cultivated land or vegetable garden. Short, double edged Maasai sword. See Pages for more info. The next post describes more of my relationship with Sheila and Joe.